4/28/2009Share this story on Facebook! The HOME community traveled to NYC to see "In the Heights" on Broadway. Ithaca offers specialty housing to suit a variety of tastes and interests. Read about our other communities below, but please note that not all specialty housing is offered every year. Located in Upper Quad buildings Boothroyd, Rowland, and Tallcott, this program is designed to assist first-year students in transitioning to college life smoothly by helping them manage new issues that may arise during their first year away from home. This community is designed to help its residents learn survival techniques, while gaining leadership skills and knowledge about environmental issues. Group activities include outdoor camping, hiking trips, and workshops on both environmental issues and leadership. One of the most popular residential programs on campus, the Sustainably Conscious Living Community encourages its residents to live sustainably in order to improve the environment, society and the economy. Members of this community also participate in camping adventures, tours, educational programs, group meetings, and community dinners. The language communities -- Vecinos (Spanish), Stockwerk Deutsch (German), Amici (Italian), and Quartier François, (French) -- are designed to give beginners and experts alike the opportunity to immerse themselves in a given culture and speak a langauge other than English on a day-to-day basis. Our newest specialty-housing option is designed to address the needs of students who want to live in a community that is supportive of all sexual orientations and gender identities, students who want to live with whomever they choose despite their gender identity, and students who want to live in housing where they do not have to identify their gender in order to use the restroom facilities. Benjamin Litoff ’12 applied to live in HOME because he wanted to hang out with a diverse group of friends. “Different people bring with them different experiences. It never gets boring hanging around them,” he says. At orientation, HOME residents painted letters for a sign that now hangs in the entryway to their building. HOME works to give students a real-world understanding of diversity through classes, programs, trips, and other events, while fostering a close-knit, residential community. 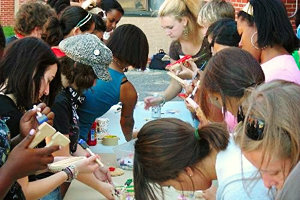 Residents even take one multicultural-based, three-credit class together their first semester. Past courses have included Introduction to African Diaspora, Social Change, and Introduction to American Literature. Outside of the classroom, students explore diversity through social events, lectures, and faculty-led seminars. Typically, HOME offers more than 50 programs each semester, varying from group trips to lectures and performances all over campus to cultural dinners and events happening right in the building. The HOME program also arranges day trips out of town. 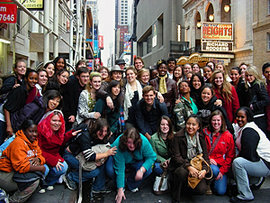 For example, HOME residents recently traveled to New York City to see the Broadway show In The Heights. MLK scholar Dana Rivera ’12 says that the HOME orientation at the start of the year, coupled with other social events, allowed her to get to know people a lot better than she would have if she had lived somewhere else. “It’s very easy for students to lock themselves in their rooms, but I think having the requirements gives them a responsibility to branch out of their box,” adds Chandra. More Fuse stories about residential life at Ithaca!